Make Your Fitness Routine More Productive! I write a lot about increasing activity and fitness in and outside the workplace. Companies can provide employees with education about fitness to help improve employee health. One easy way to give employees great information about stretching and weight training is to put up posters from Productive Fitness. 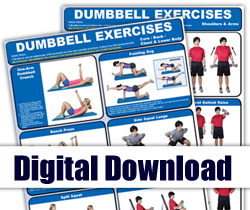 At home, Productive Fitness provides mini versions of these posters via digital download. What’s So Great About Productive Fitness? Productive Fitness Products Inc. is the #1 supplier of fitness books to exercise equipment stores in North America. Mike Jespersen started Productive Fitness Products Inc. with the publication of The Great Dumbbell Handbook. The idea of publishing a book specific to dumbbells came when Mike was working at a local fitness equipment store in Vancouver, B.C. Many of the customers purchasing dumbbells also wanted a reference guide to performing the exercises. The book was an instant success and has now sold over 300,000 copies. This success has been expanded upon with The Great Body Ball Handbook now having sold over 300,000 copies, and The Great Handbook series having sales of over 1.2 million. Since Productive Fitness Products’ incorporation in 1998, it has continued to publish books, expanding on its series of “Great Books” which offer instruction on specific exercise topics such as the Body Ball, Stretch Tubing, and multi-station gyms. The “Great Books” are designed as quick-reference handbooks which allow readers to instantly access exercise descriptions for a particular body part. Each exercise description has a start and finish photo with clear, concise, step-by-step exercise descriptions. • See a sample of Productive Fitness videos on You Tube here. Who Writes and Reviews Productive Fitness Products? • Andre Noël Potvin is an internationally accredited author, fitness educator and medical exercise specialist with 24 years of leadership experience and clinical experience. Owner and operator of both a medical fitness clinic and school for fitness professionals, Andre is frequently invited to lecture at international public and professional conferences. Read more about Andre here. 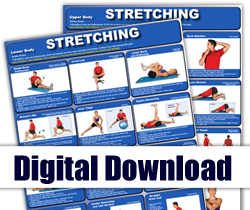 • Digital Download Posters (8.5 x 11) for home workouts.